The Maharashtra Real Estate Regulatory Authority (MahaRERA) has directed Skyline Construction Co, part of the RNA group, to refund Rs1.58 crore along with an interest of 10.55% to a homebuyer for delay in possession. The authority, while giving the judgement accepted as valid, the allotment letter issued by the builder even though there was no sale agreement. In this case, an allotment letter received by the complainant contained terms and conditions of the “you can’t lose” (YCL) scheme promoted by Skyline. On perusal of the allotment letter and letter of intention, Mr Kapadnis pointed out that the respondents had indeed agreed to sell the flat to the complainant by accepting Rs1.59 crore as cost of the flat. 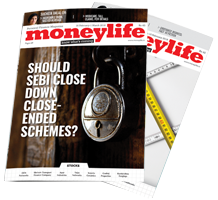 The case is related with one Manish Mody, who had bought a flat in RNA Exotica project of Skyline Construction Co. When he failed to get possession on the due date, he approached the MahaRERA. In its contention, Skyline said that it has not signed any agreement with Mr Mody or given any assurance on agreed date for possession. It further claimed that the construction was being monitored by the Bombay High Court and the agreed date of project completion is 31 October 2019, therefore the complaint is premature and not maintainable. Skyline further stated the delay in construction was due to illegal encroachments on the plot of land plus a host of sanctions that need to be taken from various authorities. One of the reasons it cited, was not receiving no-objection certificate (NOC) from the Airport Authority of India till August 2015. Subit Chakrabarti, counsel for Skyline Constructions also informed that the developer had to reduce height of the building by five residential floors, permission for which had to be sought from the Mumbai Metropolitan Region Development Authority (MMRDA). Skyline received approval from MMRDA only in August 2017; the counsel said emphasising that such delays were beyond the developer’s control. Mr Kapadnis from MahaRERA said, as information available from the documents, the complaint squarely falls under Section 18 of RERA. 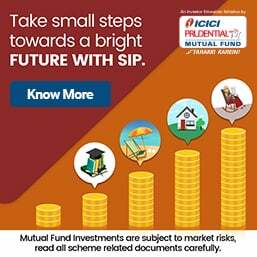 “Even though the delays are genuine and are taken for granted; the builder cannot claim an extension of more than six months of date of possession in view of section 8(b) of Maharashtra Ownership Flats Act and is liable to pay the complainant the refund plus the interest at the prescribed rate,” he concluded. 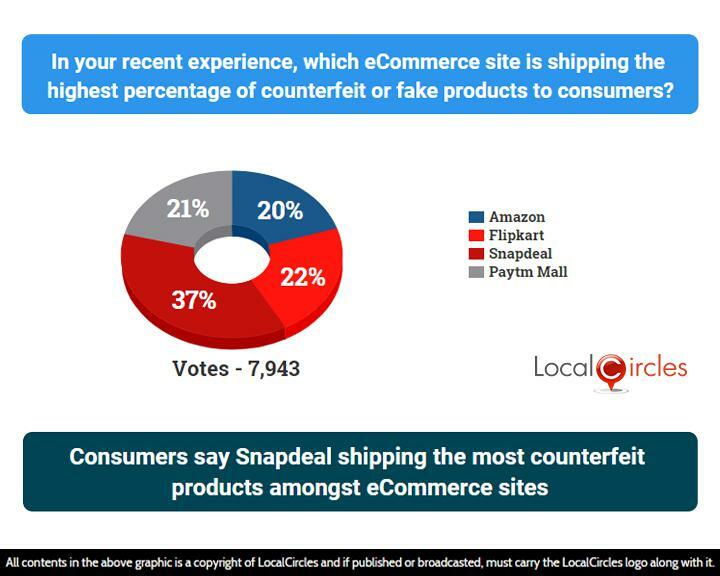 While Indian consumers are increasingly turning to ecommerce sites for the convenience of making purchases and the discounts they offer, one in every five customers did receive fake products in the past six months, reveals a survey. While 19% consumers admit to receiving a fake product from ecommerce sites in the last six months, majority, however, still do not know how to identify a counterfeit. LocalCircles, a social media platform conducted the survey, which saw participation by over 27,000 unique consumers from over 200 districts from across India. Some of the consumers on the platform have also raised a strong concern suggesting that some ecommerce sites not only tend to ignore counterfeit sellers but promote such sellers as it allows them to offer the big discounts. Genuine products of international brands cannot afford to be sold at 50-80% off, according to many consumers. 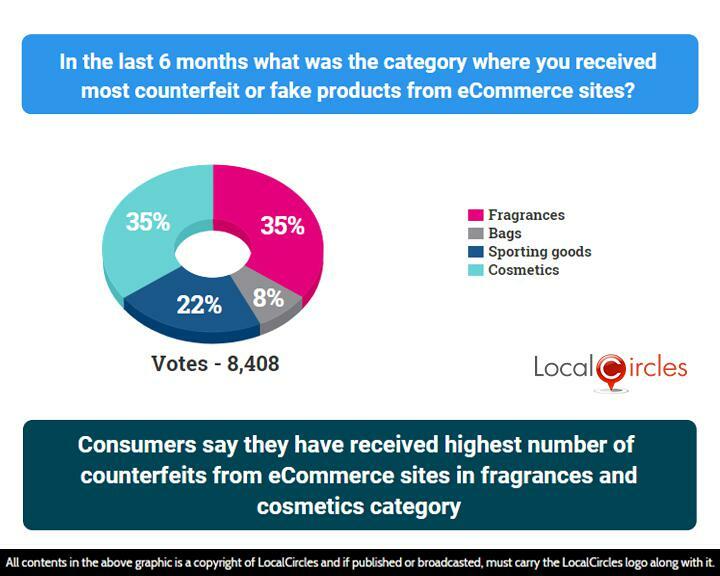 According to the Survey, about 35% had received counterfeit products in fragrances and perfumes category while 8% got fake bags. 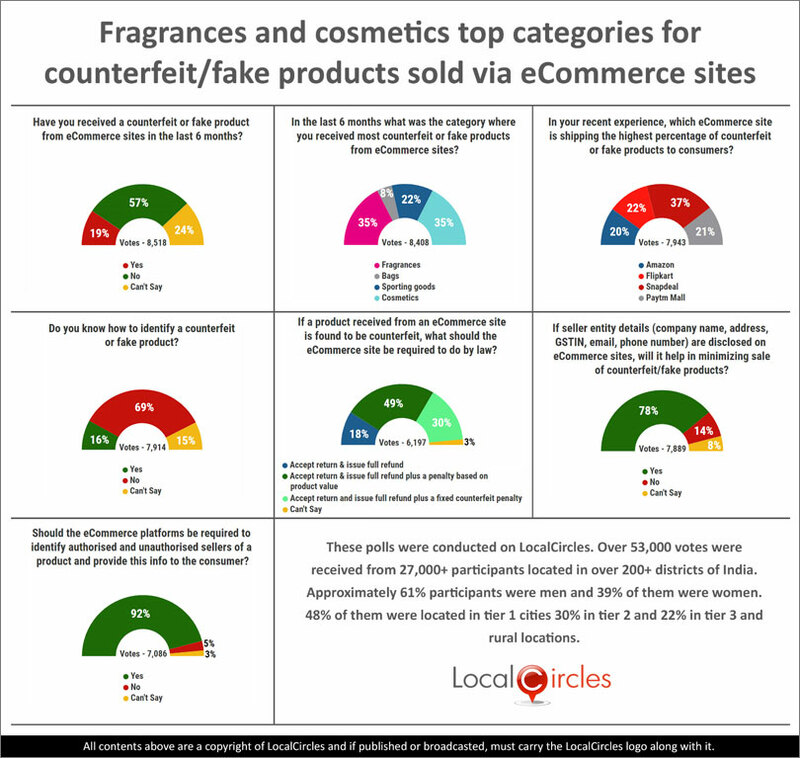 Around 22% had received counterfeit sporting goods while 35% got fake cosmetic products from ecommerce sites. 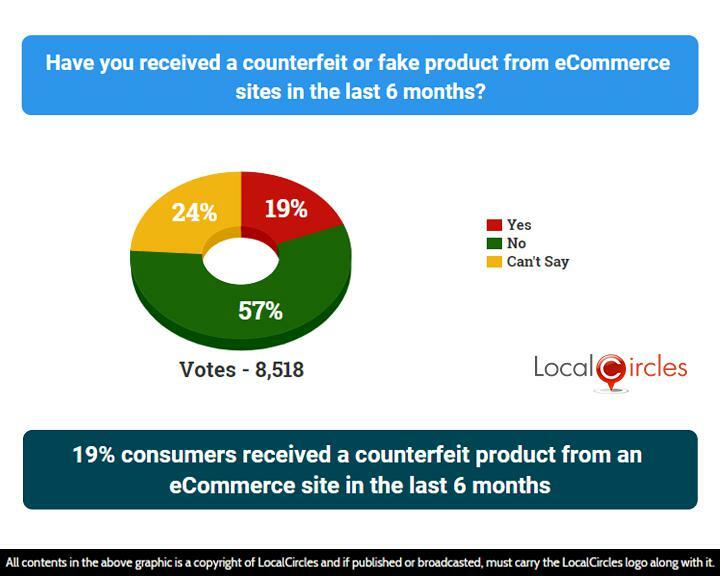 About 19% consumers in the first question admitted to having received a counterfeit or fake product from an ecommerce site in the last 6 months, while 57% denied it. About 24% said they were unsure about it. The Drug Controller General of India recently issued notices to leading ecommerce portals like Amazon and Flipkart for allegedly selling spurious and adulterated cosmetics, mainly imported brands, some of which contain harmful ingredients, which could be harmful for humans. Consumers who had received counterfeit products in the past, also identified the categories in which they received the most fake products in the last six months. Around 35% said fragrances & perfumes and 8% said bags. Around 22% said sporting goods while 35% said cosmetics. Last months in a raid, fake sporting goods worth lakhs of rupees were seized from different warehouses in the city of Meerut, which is considered to be the hub of sporting goods manufacturers. It was said that these sellers were getting ready to sell these fake goods on various ecommerce sites during the festive season and most of the goods were replicas of multinational brands. The next question asked the consumers their experience about their perception as to which ecommerce site ships the highest percentage of fake products. While 37% said Snapdeal, 22% said Flipkart, 21% said Paytm Mall, while 20% said Amazon. Consumers are reporting regularly about getting cheated when they buy products from smaller ecommerce sites. 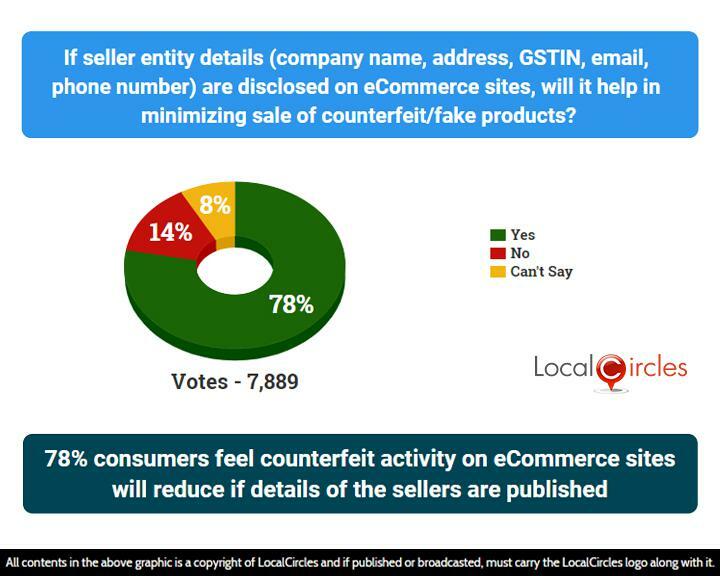 In the next poll, 69% consumers said that they did not know how to identify a fake product and just trust the ecommerce platforms blindly when they buy products from them. Only 16% said they know how to identify fakes and 15% were not sure about it. 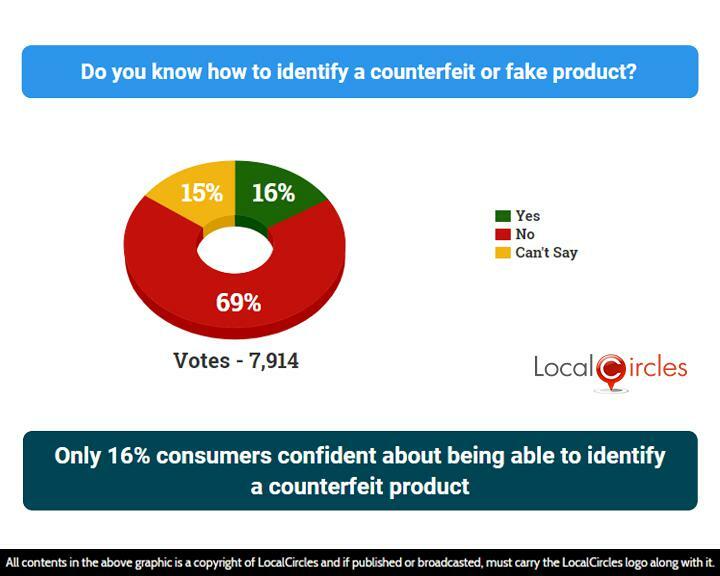 “The above is quite concerning in the sense that the number and percentage of counterfeits being shipped could be much higher, if consumers knew how to identify a counterfeit product,” LocalCircles says. When asked what an ecommerce company should be required to do by law if a product received from them is found to be counterfeit. 49% said they should accept return and issue full return plus a penalty based on product value. 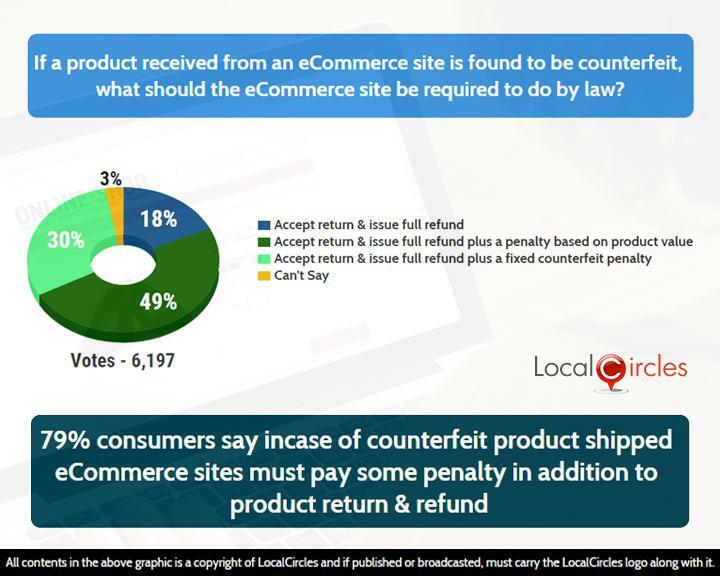 Around 18% said they should just accept returns and issue a full refund while about 30% said they should accept return and issue full refund plus a fixed counterfeit penalty. Consumers want the ecommerce platforms to hold their sellers accountable and get them to pay up these penalties if they were to ship counterfeits to consumers. Consumers have also demanded that the ecommerce portals should take steps to ensure that the products sold on their site are genuine. The following question asked if the seller entity details (company name, address, GSTIN, email, phone number) are disclosed on ecommerce sites, will it help in minimizing sale of counterfeit or fake products. About 78% said yes while 14% said no and 8% did not have an opinion. 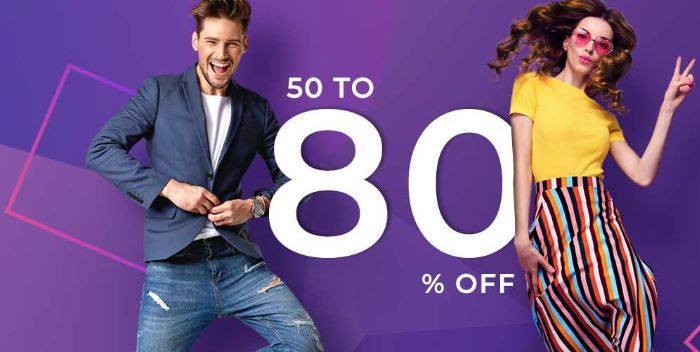 Many consumers tend to go by the discount offered and many times ignore the fact that an original product cannot be sold at such a low price, says LocalCircles, adding the said discounts of “50 -80% off’ tends to blind sight the consumers and lures them to buy fakes. 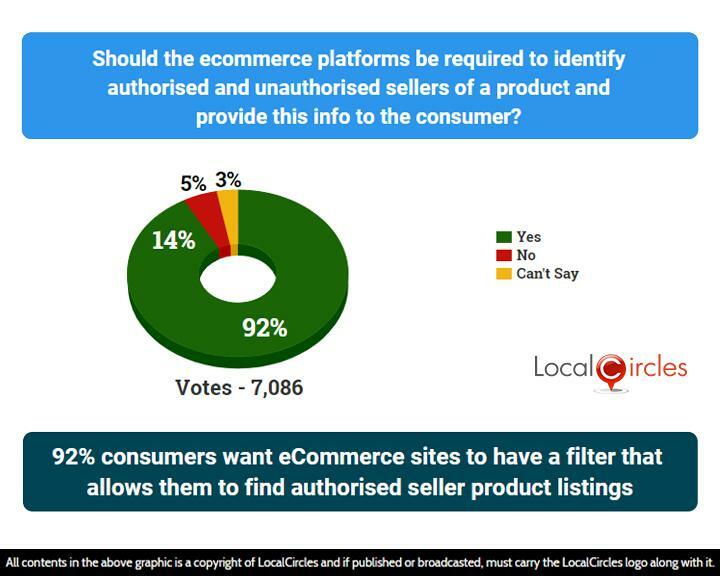 Next question asked if the ecommerce platforms should be required to identify authorised and unauthorised sellers of a product and provide this info to the consumer. About 92% replied in a yes while 5% replied in a no. Paytm Mall, in mid-2017 said it had delisted over 85,000 sellers, in an effort to block fraudulent sellers from signing up on their platform. Flipkart in past has said it removes counterfeit items from its platforms regularly and claims to have a ‘zero tolerance policy’ for counterfeit goods. Globally, counterfeit product selling is a big business amounting to almost $500 billion annually and causing huge losses to brands. Although ecommerce companies have tried to work on the problem, a lot remains to be desired. LocalCircles says it will be submitting a version of this report, the aggregated consumer complaints received and the solution recommendations to the department of consumer affairs under the ministry of commerce and other government departments based on their nature. To provide a simple and cost-effective remedy to redress the grievances of an aggrieved consumer, the Consumer Protection Act (COPRA) was enacted in 1986. A consumer who receives defective goods, or experiences deficiency in any service availed by him, can knock the doors of a consumer forum and seek relief from it.